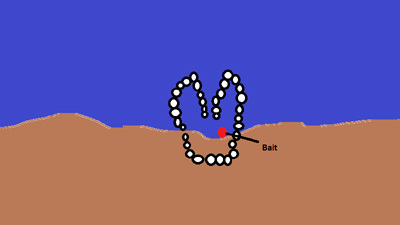 Primitive fishing techniques are very useful skills to know if you find yourself in a survival situation. The chores of survival require a lot of calories which can be hard to replace out there in the woods. In some areas fish are a great survival food – if you know how to catch them. They provide protein, fat and essential nutrients – vitamins and minerals that are important for muscle and bone health. Here in the Pacific Northwest entire primitive societies were built around the seasonal migrations of a certain fish - salmon! In this article I’ll share three methods of obtaining fish in a survival situation if you are caught out there without any modern fishing tackle. Fish spears are simple and easy to make but require a lot of skill and knowledge to use successfully. They are only practical on certain types of fish and in certain environments. 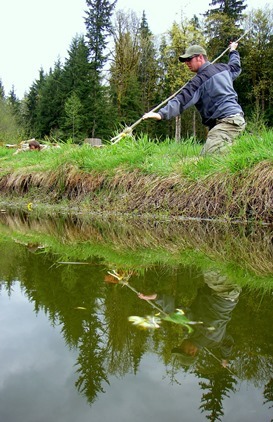 The ideal conditions for hunting with a fish spear are areas with heavy cover on the bank and clear or shallow water where you can see the fish. Carp and catfish “root” in the early mornings near the shores of ponds and slow moving rivers so if you find a spot with good cover, you might be able to catch one in the act. If you have patience and materials available to make fishing line and a hook, this can be a viable option. The best location for this method is a bank with good cover and a sharp drop off. It is hard to get a long cast with natural cordage and you need deep water to get fish to come right up to the bank so find a spot where the water drops down deep right next to the bank. Use live bait – grasshoppers are great. If you want to catch one fish it will probably take 5 grasshoppers. So if you want to catch 5 fish you should collect 25 grasshoppers. Pull their heads off and skewer them on a grass stalk (for easy storage). When you fish with one of these natural hooks there is no barb so you need to hook the fish in the lip and flip it out of the water onto the bank. Be quick to jump on the fish before it flops back into the water. 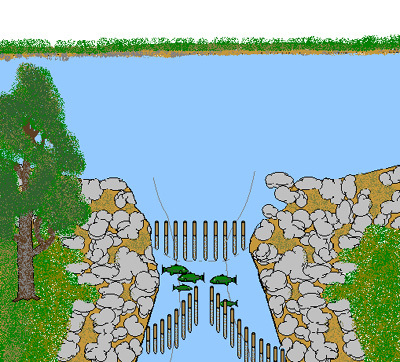 Fish traps are widely used all over the world as a means of procuring fish, crabs, and lobsters for food, both by those who use modern and primitive fishing techniques. They are a good option in areas where fish are funneled by a narrow spot in the river or when there is a major salmon run. Bottom feeders like catfish and carp can also be caught in fish traps that are baited on the shore of a pond or slow moving river. 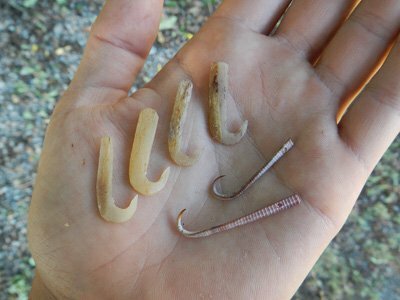 All of these primitive fishing techniques can provide food in a survival situation. The method you choose will be dictated by the body of water and species of fish you seek. Remember that in most states there are laws that forbid the use of primitive fishing implements. 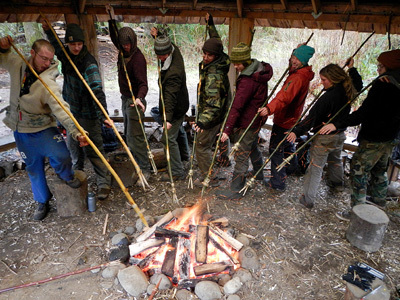 Check your state’s regulations before heading down to the river to practice with your spear!